Haw, C. 2015. An audit of nursing reports for First-Tier Tribunals in a secure inpatient service. Journal of Psychiatric and Mental Health Nursing, Vol. 22, Issue. 6, p. 407. Kinderman, Peter 2014. A Prescription for Psychiatry. p. 126. McKeown, Mick Ridley, Julie Newbigging, Karen Machin, Karen Poursanidou, Konstantina and Cruse, Kaaren 2014. Conflict of roles: A conflict of ideas? The unsettled relations between care team staff and independent mental health advocates. International Journal of Mental Health Nursing, Vol. 23, Issue. 5, p. 398. Wu, Hui-Ching Tang, I-Chang Lin, Wan-I and Chang, Li-Hsing 2013. Professional values and attitude of psychiatric social workers toward involuntary hospitalization of psychiatric patients. Journal of Social Work, Vol. 13, Issue. 4, p. 419. Jones, Chris Nimmagadda, Srikanth and Veitch, Paul 2013. Mental health tribunals in England and Wales: a representative's guide. Advances in Psychiatric Treatment, Vol. 19, Issue. 1, p. 40. ALDRIDGE, M. A. 2012. Addressing non-adherence to antipsychotic medication: a harm-reduction approach. Journal of Psychiatric and Mental Health Nursing, Vol. 19, Issue. 1, p. 85. 2012. Mental Illness, Discrimination and the Law. p. 63. Gangopadhyay, Partha 2010. Proportionality of legal discrimination. International Psychiatry, Vol. 7, Issue. 01, p. 24. Molodynski, A. Rugkasa, J. and Burns, T. 2010. Coercion and compulsion in community mental health care. British Medical Bulletin, Vol. 95, Issue. 1, p. 105. Kogstad, Ragnfrid Eline 2009. Protecting mental health clients' dignity — The importance of legal control. International Journal of Law and Psychiatry, Vol. 32, Issue. 6, p. 383. Spandler, Helen and Calton, Tim 2009. Psychosis and Human Rights: Conflicts in Mental Health Policy and Practice. Social Policy and Society, Vol. 8, Issue. 02, p. 245. Campbell, James 2008. Stakeholders' views of legal and advice services for people admitted to psychiatric hospital. Journal of Social Welfare and Family Law, Vol. 30, Issue. 3, p. 219. Kinderman, Peter and Tai, Sara 2008. Psychological models of mental disorder, human rights, and compulsory mental health care in the community. International Journal of Law and Psychiatry, Vol. 31, Issue. 6, p. 479. Gable, Lance 2007. The Proliferation of Human Rights in Global Health Governance. The Journal of Law, Medicine & Ethics, Vol. 35, Issue. 4, p. 534. HURLEY, J. and LINSLEY, P. 2006. Proposed changes to the Mental Health Act of England and Wales: research indicating future educational and training needs for mental health nurses. Journal of Psychiatric and Mental Health Nursing, Vol. 13, Issue. 1, p. 48. Kelly, Brendan D. 2006. The power gap: Freedom, power and mental illness. Social Science & Medicine, Vol. 63, Issue. 8, p. 2118. Dibben, Claire Luen Wong, Mai and Hunt, Neil 2005. Mental health tribunals: an issue for clinical governance. Clinical Governance: An International Journal, Vol. 10, Issue. 4, p. 300. Darjee, Rajan and Crichton, John 2005. Reid v. the United Kingdom: Restricted patients and the European Convention on Human Rights. Journal of Forensic Psychiatry & Psychology, Vol. 16, Issue. 3, p. 508. Dolan, M Thomas, SD Thomas, SL and Thornicroft, G 2005. The needs of males detained under the legal category of ‘psychopathic disorder’ in high security: Implications for policy and service development. Journal of Forensic Psychiatry & Psychology, Vol. 16, Issue. 3, p. 523. Kingdon, David Jones, Roland and Lönnqvist, Jouko 2004. Protecting the human rights of people with mental disorder: new recommendations emerging from the Council of Europe. British Journal of Psychiatry, Vol. 185, Issue. 04, p. 277. Council of Europe (2000) White Paper on the protection of human rights and dignity of people suffering from mental disorder, especially those placed as involuntary patients in a psychiatric establishment. Strasbourg: Council of Europe. Department of Health (2000) Reforming the Mental Health Act. Part 1. The new legal framework. London: Stationery Office. Gostin, L. O. (2000) Human rights of persons with mental disabilities. 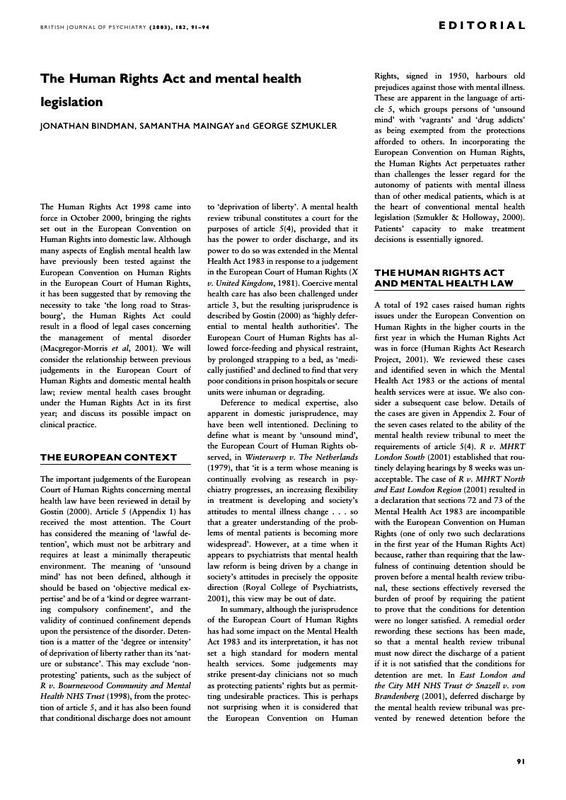 The European Convention on Human Rights. International Journal of law and Psychiatry, 23, 125–129. Grounds, A. (2001) Reforming the Mental Health Act. British Journal of Psychiatry, 179, 387–389. Human Rights Act Research Project (2001) Monitoring the Human Rights Act. London School of Economics and Doughty Street Chambers. http://www.doughtystreet.co.uk (follow links to HRARP Project – statistical analysis). Macgregor-Morris, R., Ewbank, J. & Birmingham, L. (2001) Potential impact of the Human Rights Act on psychiatric practice: the best of British values. British Medical Journal, 322, 848–850. Szmukler, G. & Holloway, F. (2000) Reform of the Mental Health Act: Health or safety? British Journal of Psychiatry, 177, 196–200. Anderson and Others v. The Scottish Ministers and Another (2001) Times Law Report 29 October. East London and the City MH NHS Trust & Snazell v. von Brandenburg (2001) 3 WLR 588. R v. Ashworth Special Hospital Authority, ex parte N (2001) Times Law Report 26 June. R v. Bournewood Community and Mental Health NHS Trust, ex parte L (1998) 3 All ER 289. R v. Camden and Islington Health Authority, ex parte K (2001) 3 WLR 553. R v. MHRT London South, ex parte C (2001) Lloyds Rep Med 340. Rv. MHRT North and East London Region, ex parte H (2001) 3 WLR 512. R v. Secretary of State for Health, ex parte L (2001) Times Law Report 26 October. R v. Secretary of State for the Home Department, ex parte X (2001) Times Law Report 9 January 2001 (Judgement 11 October 2000). R v. The Responsible Medical Officer Broadmoor Hospital and Others, ex parte Wilkinson (2001) EWCA Civ 1545, Times Law Report 2 November. Winterwerp v. The Netherlands (1979) 2 EHRR 387. X v. United Kingdom (1981) 1 BMLR 98.